Whew, what a day! A little background first. Since the start of the season BroadBand Corp has been handling all aspects of the EagleCam. They installed it, got it up and running and aside from some minor glitches have kept it up and running for us to view these marvelous eagles. They were also taking responsibility for the Chat and Social Stream management. MN Bound is the marquee name on the cam. 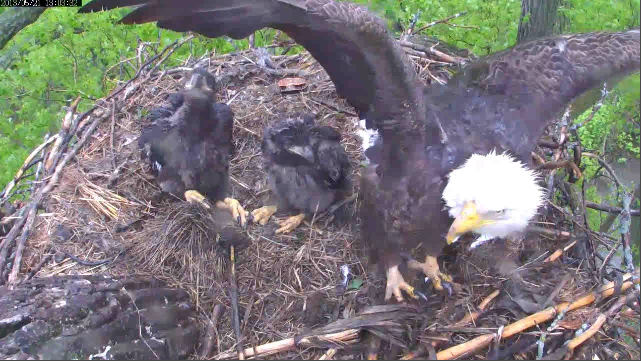 It is their EagleCam and it is a big draw for them on this website. They and BBC have been cooperating to bring us this cam for a few years now. In the past few weeks BBC and MN Bound have been discussing new ways to manage the Social Stream and Chat on the site. As of today MN Bound is responsible for the day to day goings on in the Social Stream and Chat areas of the Ustream feed and BBC will continue to handle all the technical aspects of keeping us provided with the stunning pictures we have come to expect from this cam. What does this mean? As you may know MN Bound has a LoonCam that has been running for many years without mods. They have decided to try this model with the EagleCam for the present time. All of our magnificent mods were thanked for their service and it is hoped that they will stay with us through the rest of the season to help answer questions and provide us with their Eagle knowledge as they have in the past. I will continue to bring you this blog so that those who can’t be with us on the nest will have a place to catch up every day. Razzle will still be doing our vids for us and lots of chatters will still be posting pics to the MN Bound LIVE Eagles Facebook Page page. So please stay with us as we transit these interesting times. I am sure the cam will be all the better for the changes. What went on in the nest today? Nothing special. (I’m kidding!) Harmony and Peace had another growing day on the nest. They are getting more adept at using their talons as walking platforms instead of just clown feet decorations. Wingersizing has been picking up and head slaps with wings were sometimes the order of the day. Mom and Dad have settled into the two or three big meals a day routine and are making the kids compete for bites. Nest renovations continued again today and some new greens made it to the nest. I really do want to go fishing with Mom and Dad when the season is over. They manage to bring back some of the largest fish I have seen in a long time. I just want to watch where they fish so I will know the good spots for later. It was a little rainy at the nest area today but things should be clearing out soon and the eagles are due for some sunshine. As evening fell the kids settled in and Mom stood watch over them as usual. Another fine day at the MN Bound nest was complete. On to the vids of the day. The kids got damp from the morning drizzle and BBC treated us to some panning. Mom gives a demo on how to shake out her feathers and the kids follow suit. Ok, On my count.... HEY, Pay attention! Hey Harmony,This renovation stuff is gettin' ridiculous! As always a big tip of the talon to Razzle and BBC for the great pics and vids! I hope you had a great day on the nest and we’ll see you there tomorrow.